As is often part of the two-year commuter college experience in America, the George Mason College student body often showed signs of detachment and disinterest during the early years at Fairfax. The atmosphere at Bailey’s Crossroads in the not so distant past differed in that the number of students was smaller, the building, though quirky and in need of repair, was thought of as a special place. The relationship between the students and faculty was seen as much closer. General morale and spirit seemed to be high at George Mason, even during the controversy surrounding its director in 1965, but still students were hesitant to organize new activities and groups or take part in the creation of new college traditions. This condition was chronicled most clearly in the pages of the student newspaper, The Gunston Ledger. The idea that apathy was endemic to the George Mason College student body was a common thread in the Ledger’s description of campus life at Mason. Almost weekly, the Ledger and its readers chided their fellow classmates for their apparent lack of cohesiveness and interest in improving student life at Fairfax. Whether it was that a some students preferred to drink beer in the parking lot during off-class times, or that the student body did not react strongly enough to the mandatory dress code enacted by the administration or to early American intervention in Vietnam, or ignored three opportunities sponsored by the Ledger to choose the school’s mascot, apathy at Mason was a continuing story. A subtle change seemed to occur once Mason made the change to 4-year curriculum beginning in April 1966. All of a sudden Mason had a junior class which looked forward to becoming the first graduates of the institution. Beginning that year, the student body published both a handbook and student directory. New campus organizations began to flourish. Among them were SAGE, a women’s service club, the Pep and Glee clubs, the Women’s Athletic Association, the Sports Car Club, and People to People, to name a few . The Student Assembly drafted a new student constitution. While the fraternity Tau Kappa Epsilon was in existence at Mason since 1964, two new Greek organizations (fraternity Delta Tau Sigma and sorority Lambda Tau Omega) began in 1967, with Delta Tau Sigma sponsoring the first Spring Formal that year. A drama club named the Agora Society, which was formed in the fall of 1965, staged its first play in 1966. Agora also created a film adaptation of the Robert Louis Stevenson novella The Strange Case of Dr. Jekyll and Mr. Hyde in 1967, screening it in the new Lecture Hall Auditorium in February of 1968. Undoubtedly the most enduring traditions to emerge from the awakening of the Mason campus were Mason Day and Patriot's Day. The celebration of Mason Day sprang from the University of Virginia's tradition of celebrating Founder's Day on April 13, Thomas Jefferson's birthday. George Mason College celebrated Founder’s Day along with its parent institution since the early 1960s. Beginning in the mid sixties, the college observed “George Mason Day” the day after the University’s celebration of Founder’s Day. The first few celebrations of George Mason Day were very simple and solemn affairs. In the spring of 1965, the first George Mason Day featured a brief program of lectures and speeches given by the faculty and administration, but it soon turned into a day of shortened classes and entertainment. In 1967 it became a high-visibility event and expanded to include academic and service awards presentations, food, and an afternoon of field day-type physical activities. As George Mason College continued to develop its own unique identity, it moved away from the University of Virginia’s tradition of observing Founder’s Day altogether and celebrated George Mason Day exclusively. Students, faculty, and the administration each took a part in its organization, and it became a more festive occasion, which promoted spirit and unity on the campus. Classes were shortened or cancelled, depending upon time of day, so that all could attend the noon start of activities. After a speech by the Chancellor and presentation of awards and recognition for scholarship, the afternoon celebration would begin. 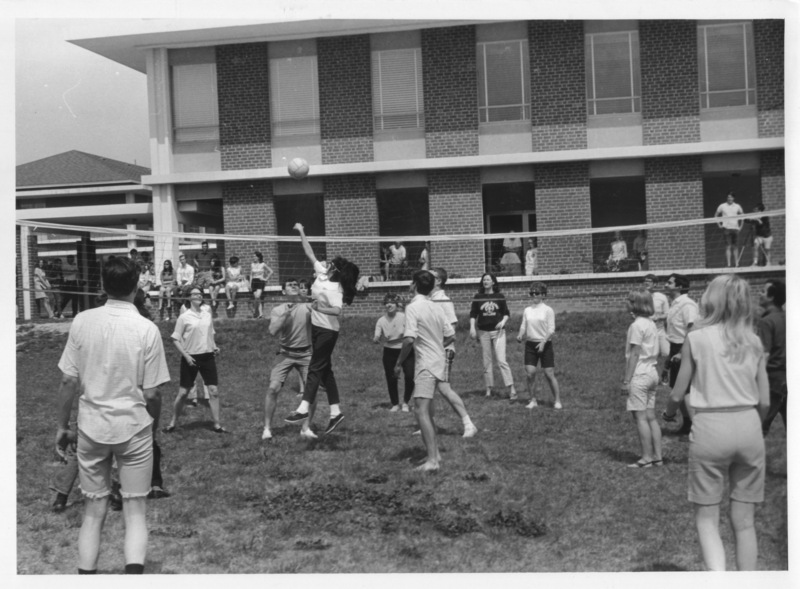 The 1968 George Mason Day featured a barbecue, the annual student/faculty softball game, a greased pig chase, tricycle races, a Hawaiian luau, the Miss GMC contest, the tug-of-war, car smash, a dunk tank, human-powered “chariot races”, and other activities; many of these would continue to be part of later George Mason Days. Music was also introduced to George Mason Day as that afternoon a “Folk Fest,” featuring a host of singers and acoustic guitar groups, took place on the Quadrangle. In 1969 George Mason Day had expanded into a multi-day event as about forty students camped behind South Building (today’s Krug Hall), their tents going up on the Tuesday or Wednesday before Friday’s celebration. Late night movies were shown in the Lecture Hall auditorium, and live musical acts played that Thursday night and Friday afternoon. Another George Mason tradition, Patriots’ Day, came into being during the fall of 1968. The entire campus was encouraged to take part in this first-ever event on December 6. Classes from 3:00 in the afternoon onward were cancelled in order to promote attendance by both the faculty and students. The astonishingly successful event was planned entirely by the Activities Board, and with great attention to detail.